"Abbey, have you been to Sorrento recently? You should've mentioned it more on your blog, I had absolutely no idea." *teehee* Sorry for the holiday spam lately, folks, but I managed to take so many lovely photos in Sorrento that I just couldn't help but share them all! If you're sick of having your wanderlust kicked up a gear by all of my photos from the Bay of Naples, don't worry! My Italy post series is very nearly complete. 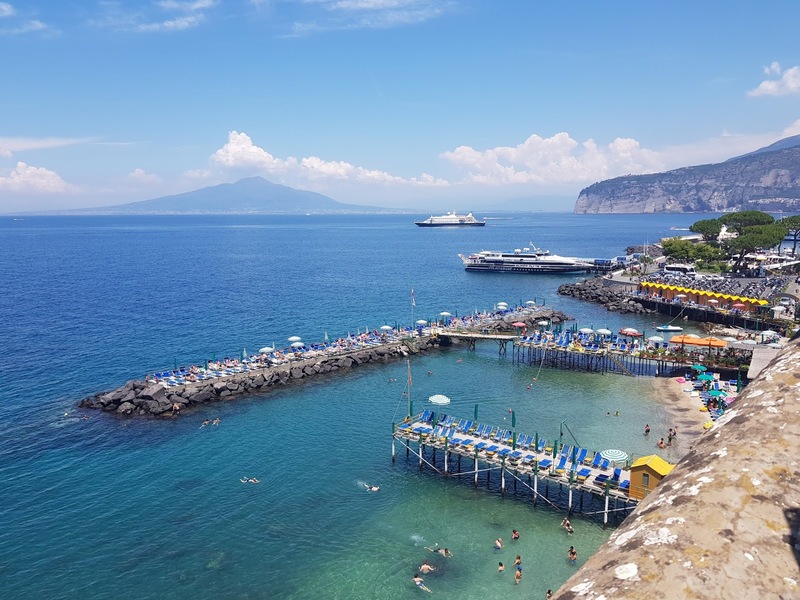 So far, I've written about my holiday wardrobe and some very silly things that I learned during my trip, but today's post is all about must-see spots in Sorrento itself. 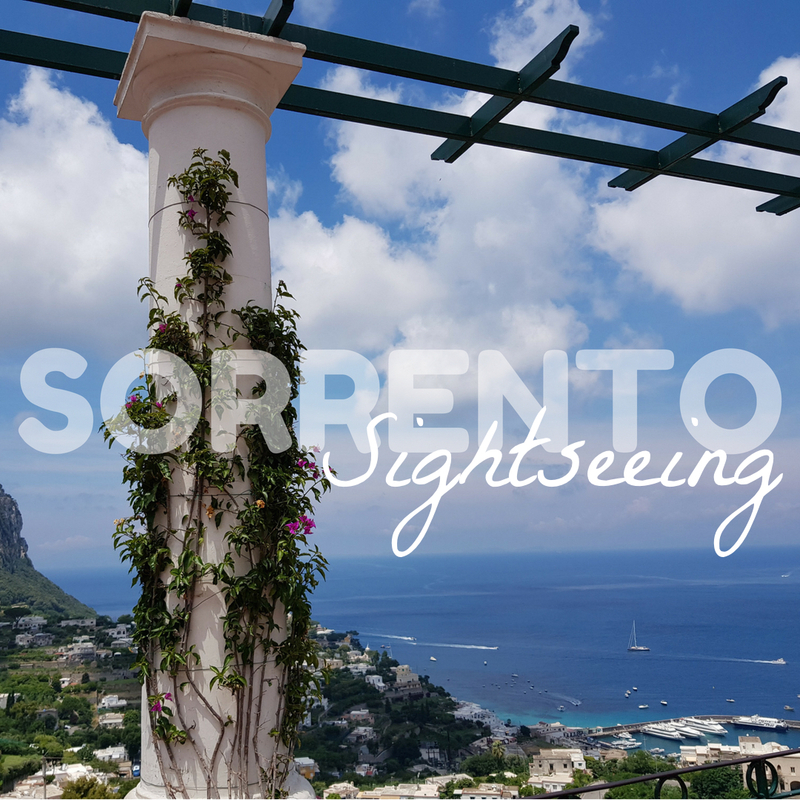 For those of you who aren't aware, Sorrento is a coastal town located in south west Italy, perched atop some pretty stunning cliffs which plunge down into the Tyrrhenian Sea. There is so much to see and do in the city and today's post aims at giving you a flavour of it all. Buckle up, it's going to be a fun one! Sorrento doesn’t have much in the way of beaches thanks to its sheer cliffs. Instead, it has two pretty marinas which have "beach-like" facilities built on stilted piers. You can pay to hire a sun lounger and swim in the sea, but the area was so jam-packed and noisy that we didn't really fancy it during our stay. As an alternative, we took a walk around the marina where fairly impressive yachts were moored. One yacht even had a tiny little Daschund on board, who we immediately fell in love with! Watching the boats move in and out of the harbour and gazing down at the crystal clear water with a peach juice in hand made for a really lovely afternoon. To get back up to the city, you can take a walk along a path embedded into the cliffs, which provides incredible views of the Bay of Naples. You can also take a glass elevator for the cost of €2 but we really enjoyed the walk. Both marinas are a must-visit for Sorrento holidaymakers! 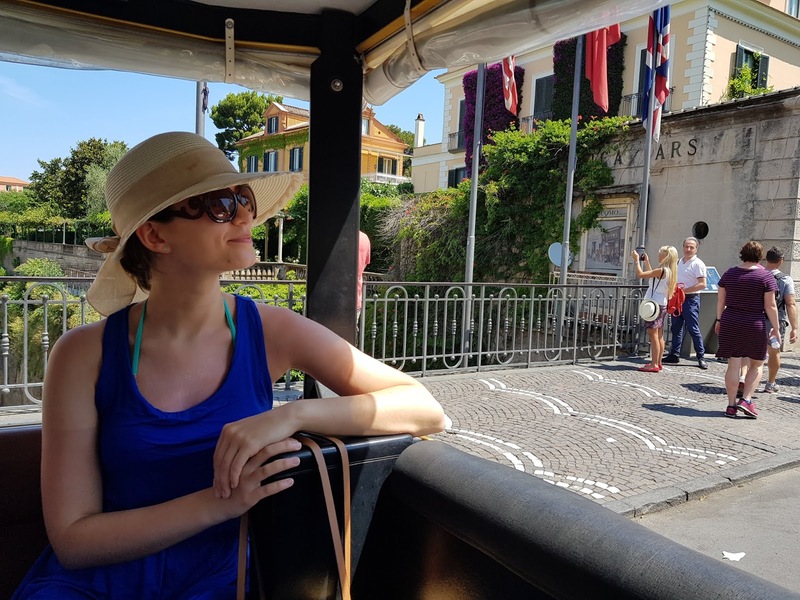 To enable us to get oriented in Sorrento early on in our trip, we decided to take a short ride on the mini tourist train that traverses the city. At only €6.50 per person for the half-hour ride and tour, we thought it was worth the investment. As you go around, pre-recorded audio plays in a selection of languages - you could choose the one that you wanted to tune into on the headphones provided. 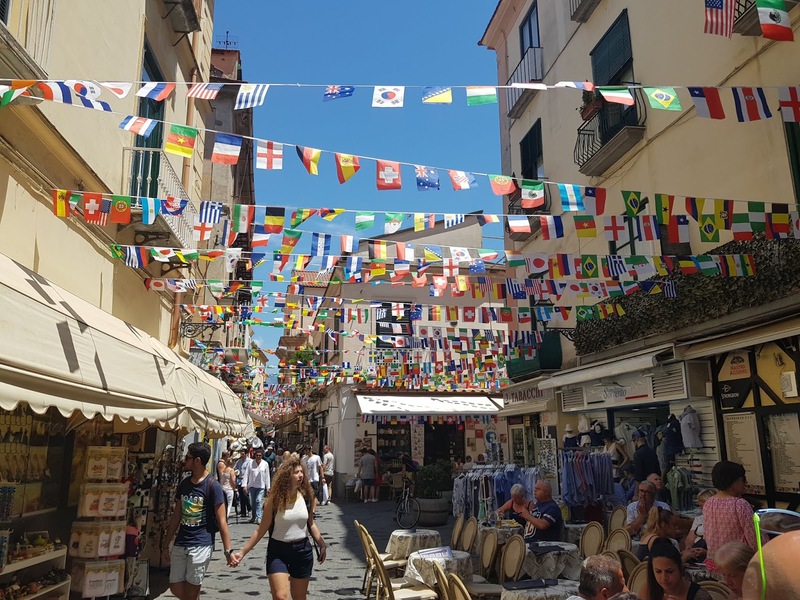 The tour pointed out lots of historic landmarks as well as telling tales of famous Sorrentian locals of the past, including artists, poets and many more. Traditional Italian music also played as we cruised through the streets, which made it an even more enjoyable experience! We lucked out by sitting right at the back of the train, which gave us great opportunity to take panoramic shots as we drove past the marina! One of the biggest things on my mum's bucket list for our time in Sorrento was going to the opera. I'm not going lie, I was a little apprehensive at the thought of spending several hours listening to a performance in a language that I don't understand all that well, but I was very pleasantly surprised. We went to see a performance by the Three Tenors, a trio who performed a selection of songs from the world's best-known operas. I was absolutely blown away by the performance. The language barrier wasn't an issue at all because the singers were able to convey everything they needed to through the emotion of their performances. I'm so glad that my mum booked the tickets, because it was an incredible experience. The performance even took place in Sorrento’s main museum, meaning that we had a truly cultural experience that night, surrounded by beautiful paintings as well as the music! Sorrento's central square is a real bustling metropolis. It can be tricky to navigate amongst the melee of mopeds and other vehicles so for the best shopping experience, it's definitely a good idea to head down one of the smaller backstreets, where traffic is not permitted. These streets are lined with more restaurants than you could ever need and a huge variety of souvenir shops. Limoncello is available from pretty much all of them if you're looking to take an authentic taste of the city home. Another regular fixture on shopfronts is locally made linen clothing, most of it manufactured not far away in Positano. The clothes are all beautiful but will set you back a pretty penny - we're talking €90 for a shirt here! 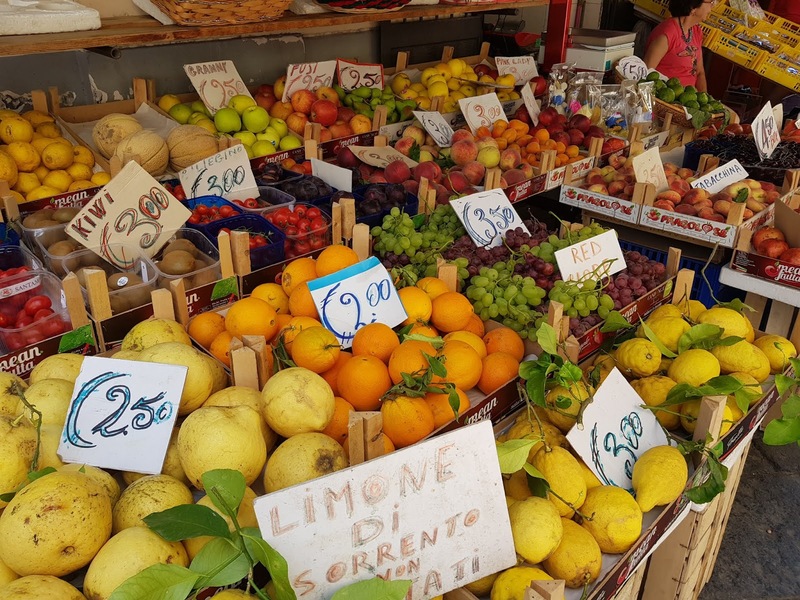 On the lower end of the price scale, what I would really recommend purchasing in the city is some of their fresh fruit. The apricots, cherries, and peaches from the market stalls are absolutely divine, some of the juiciest that you will ever taste! History and archaeology may not be everyone's cup of tea, but having studied archaeology for 4 years at university, I couldn't resist checking out what Sorrento's Georges Vallet Archaeological Museum had to offer. This museum is a bit out of the way, it took us over an hour to walk there from our hotel on the other side of Sorrento. I really wish that I could say that it was worth the trek, but sadly the museum isn't all that well stocked. There were basically three rooms which each had a few objects of interest, but only one really spectacular piece: a beautiful Roman marble sculpture of the goddess Demeter. There were some lovely examples of ancient architecture too but probably not enough to keep you in the museum for more than half an hour. I was really surprised at this since Sorrento has history stretching back to the Bronze Age! Nevertheless, I'm glad I went, but I can understand why this museum may not be top of everyone's list of things to see in the city. To judge from how crowded the ferry that we took was, sailing to Capri seems to be a very popular choice for tourists in Sorrento. Our hotel and various tour operators in the area offered boat trips to Capri that you could book the price of €55 per person, but we found a much better deal by booking direct with the ferry company at the harbour. We paid just under €40 per person for our excursion, which was a nice saving. The island of Capri itself is absolutely stunning. The island had such an effect on the Roman emperor Tiberius that he stayed holed up on Capri for many years, ruling the Roman Empire from there instead of from Rome. Given the scenery, I'm sure you can understand why! However, Capri was incredibly crowded. The streets were so narrow, meaning that whenever a small van came past, you had to flatten yourself against the walls of shops to allow them to get past. 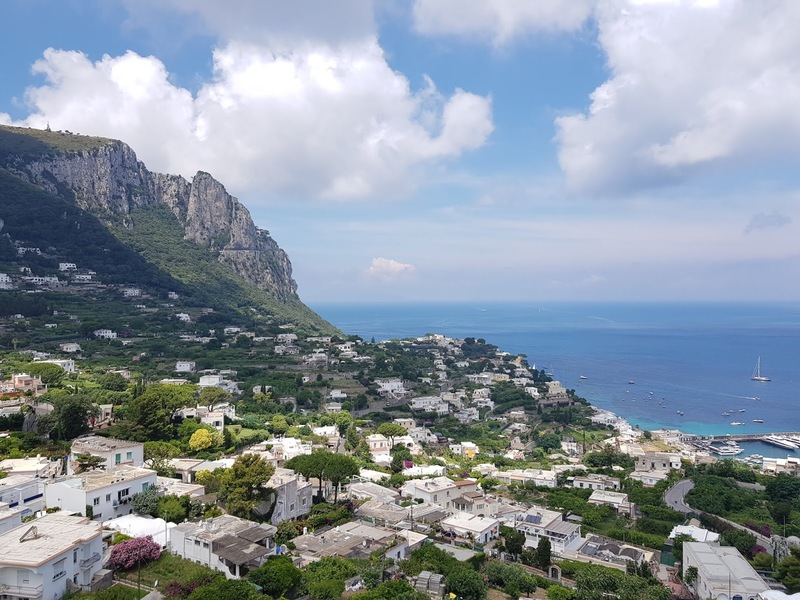 The volume of tourists was also extremely high, meaning that you couldn't easily find a space to sit down and chill out for 5 minutes, so while I'm glad we have the experience of going to Capri, I'm relieved that we didn't stay there for our whole holiday. So, there we have it, my complete guide to Sorrento's highlights. Have you ever been to Italy? Where are your must-see spots? Let me know down below.